Drifter besteht aus einem günstigen (25€) Spielzeug RC Auto im Maßstab 1:24. 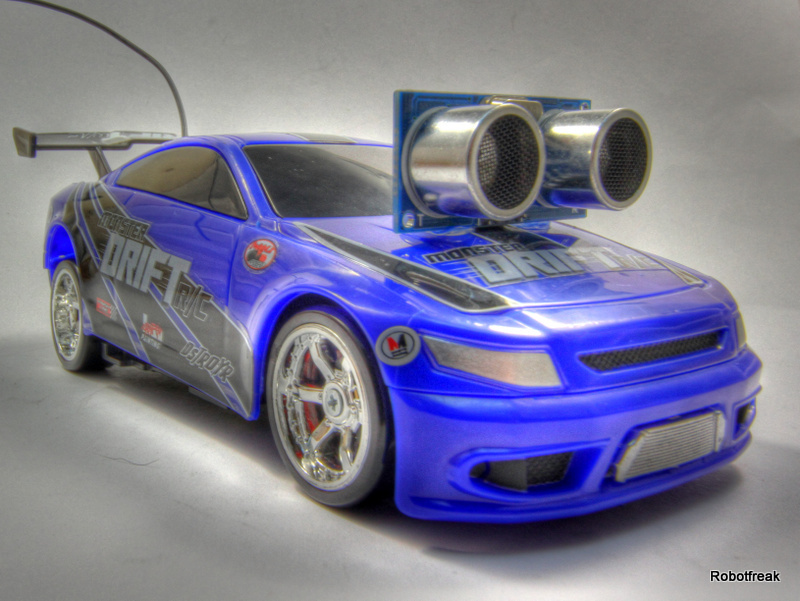 Gefunden bei Toys’r’us mit der Bezeichnung ‚Fast Lane Monster Drift‘. Die Begeisterung hält sich in Grenzen, was das Drift Verhalten betrifft. Aber was will man auch für den Preis mehr erwarten. Interessanter wird die Sache dann schon, wenn man daraus ein autonomes Fahrzeug machen möchte. 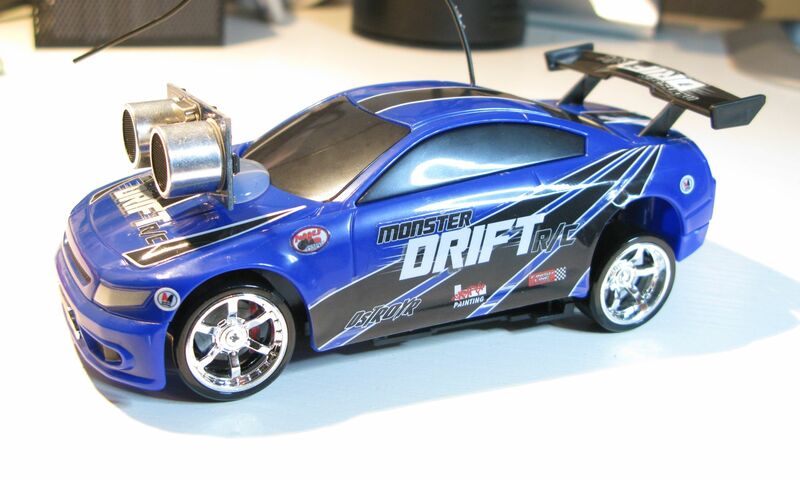 Drifter is based on a cheap RC toy car I found at Toys’r’us, named ‚Fast lane Monster Drift‘. I think it’s the same model Frits has been used in an episode of TLIHR. It doesn’t work well, you get what you pay for. But it is a good hacking platform. There is no much space left for additional electronics, but a Arduino Pro Mini fits very well on the rear axle. The onboard electronic is as usual very primitive. A PCB with a RC receiver IC, 2 H-Bridges for drive and steering motor, and a voltage regulator (3,3V). Lucky me I found the control signals going from the RC receiver to the motor drivers and an easy way to cut these connectors and put the Arduino between. That way I can use the existing remote control. 4 Inputs and 4 outputs were needed (forward, backward, left and right). As outputs the PWM capable pins 5,6,9,10 has been used to give the possibility of smooth movements, instead full speed drive and steering from the original hardware. Here is the complete schematic and wiring made with Fritzing. The Remote control is used as a mode selector. 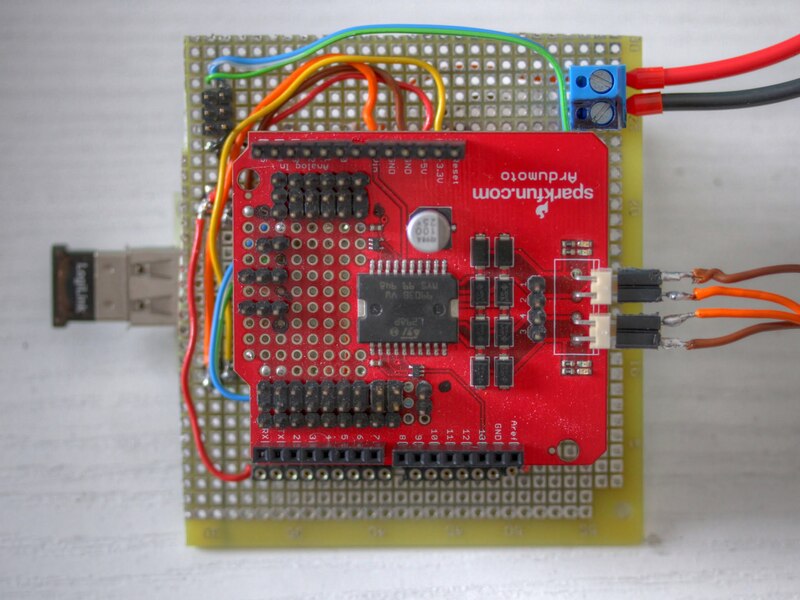 On power up the Arduino reads the remote and executes the selected mode of operation. 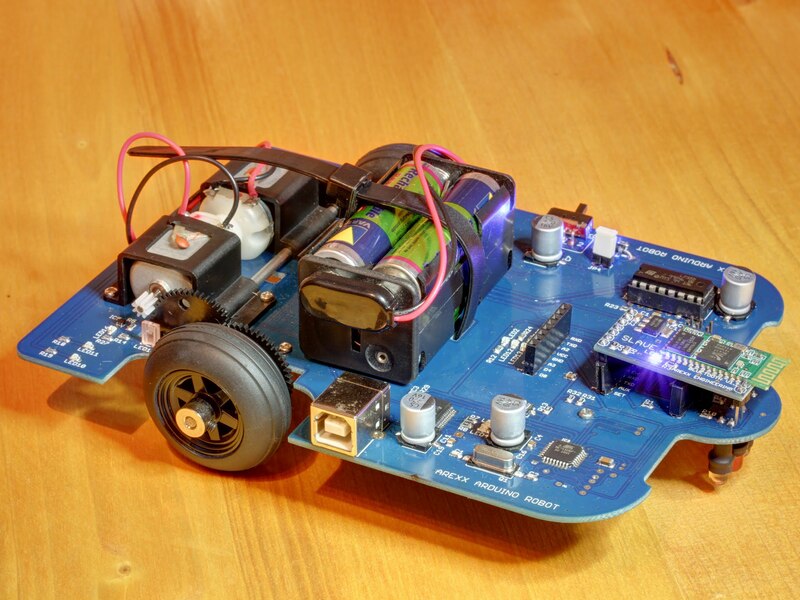 To make the car autonomous it needs a ultrasonic sensor. Unfortunately I only have a HC-SR04 ultrasonic sensor ready, witch is a 5V device. The existing electronics and the Arduino are 3.3V powered. So the HC-SR04 needs to be replaced with a SRF01 or Maxbotix sensor. Both work with 3.3V. 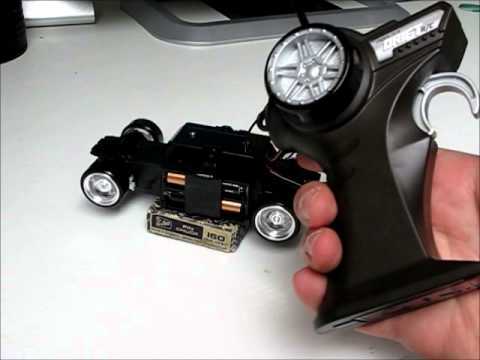 I found an interesting project of our fellow member DuaneB about using a Gyro sensor to smooth the movement of a RC car. This might be a way to make autonomous drifting possible. Lets see how far I can get. this is my actual christmas project. 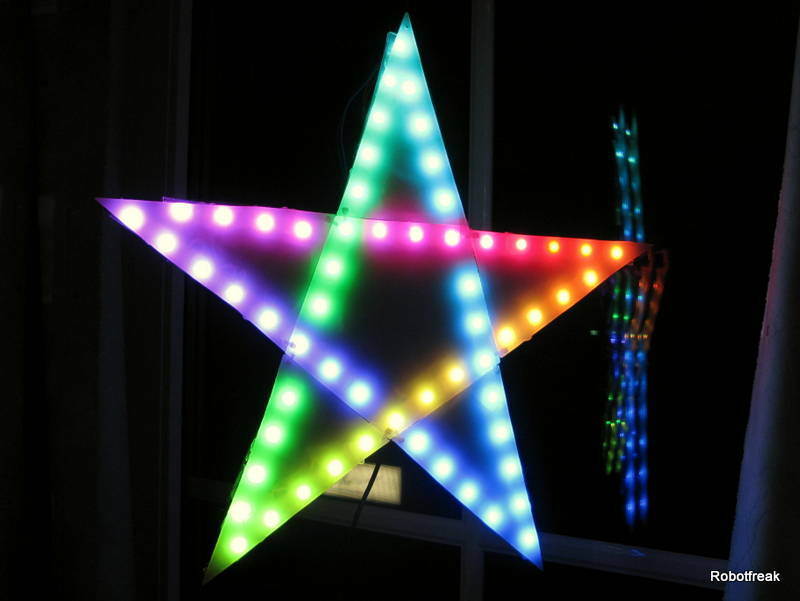 A star build out of Plexi and an Adafruit RGB LED strip. Controlled by an Arduino controller. It will be used as christmas decoration behind a window of our house. Looks pretty cool at night. Vorgestern traf ein Paket von ELV ein mit dem neuen AAR-04 Roboter von Arexx, den ich hier vorstellen möchte. The idea of this project is, to use all Arduino Shields I own to use on the IOIO board.